Adrenalina lasted one fall, got hurt, and was replaced by Power Bull in the second fall. Straight fall win. 4) Aeroman, Dragón Fly, Kanon b Atomic Star, Matrix Jr., Rey Terco Jr.
Kanon beat Rey Terco with a leglock and Matrix wiht a suplex. FILL (Eterno) versus Gym Zeuz (911). Team Eterno took 2/3, the last when Eterno beat Keiser with a martinete. Ofical AK47 ran out to help his friend and attack Eterno. 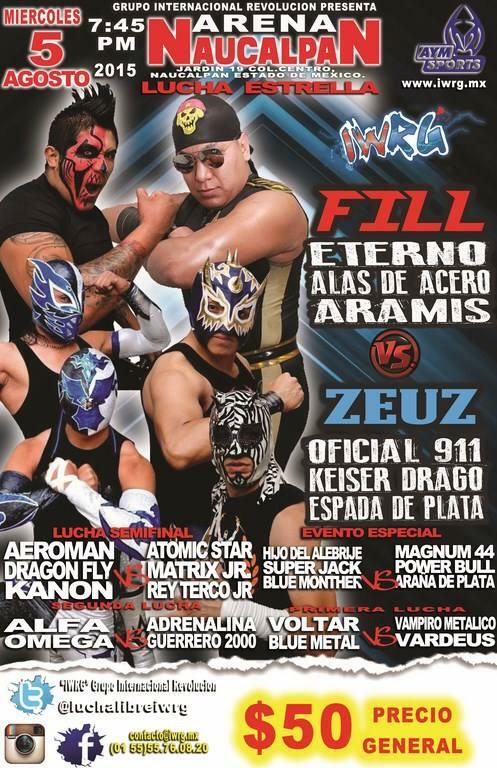 Kanon, Arana de Plata and Atomic Star ran out to save Eterno. 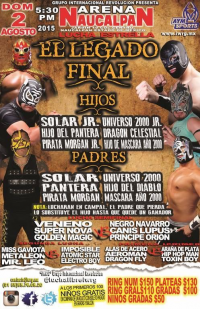 Hijo del Diablo snuck in a foul on Hijo del Pantera. Golden Magic won clean with a small package and demanded a Junior de Juniors match. Hijo del Dr. Wagner's first match here since March. 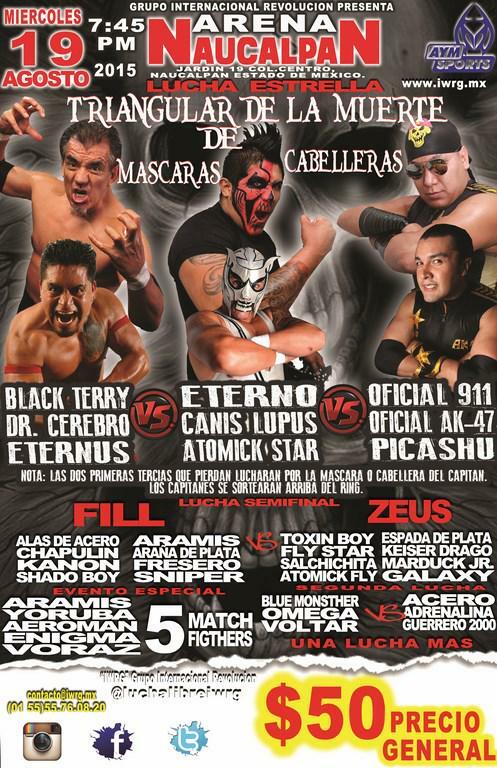 Canis Lupus replaced Cien Caras Jr. and didn't get along with AK47, leading to the loss. Match changed and made a title match on Wednesday. 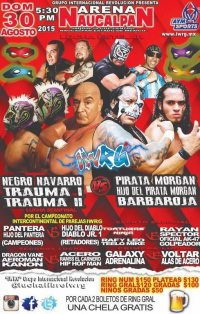 Pirata Morgan introduced Barba Roja Jr. as the new member of the family before the match, and he got involved in a fight with Trauma II before the match. Navarros took 2/3 to win the titles. Pirata Jr. fouled Trauma I in the third fall for the apparent win, but the foul was caught by the second referee. 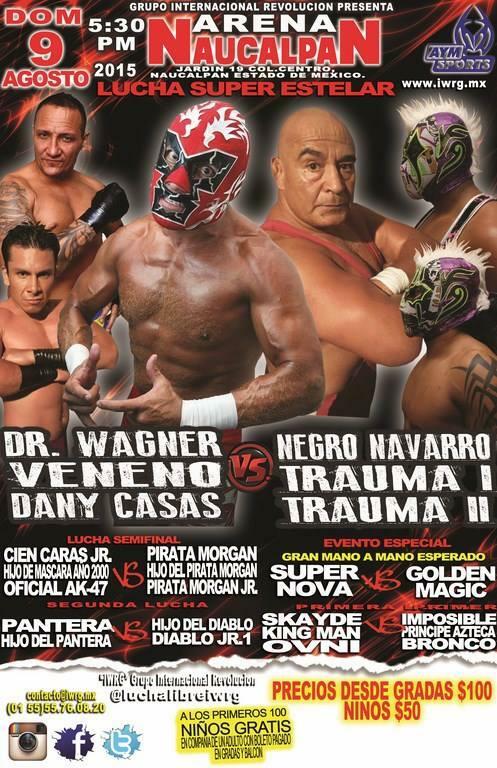 Titles change hands on DQ in Mexico. Piratas fall on second defense. Navarros are 20th known champions; this is the first time any of them have won this championship or won any trios title as a unit. 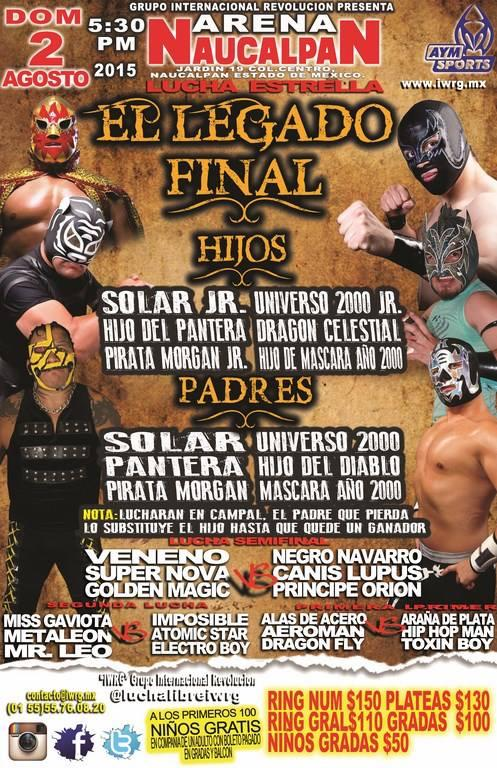 Black Dragon (probably not the old IWRG guy) replaced Hijo del Alebrije. Chapulin & Fiero replaced Matrix Jr. & Rey Terco Jr., who misses many of this shows. Gym Zeuz (Galaxy) vs Gym FILL-Eterno (Atomic Star). Kanon defeated Galaxy for the win. Money thrown in. 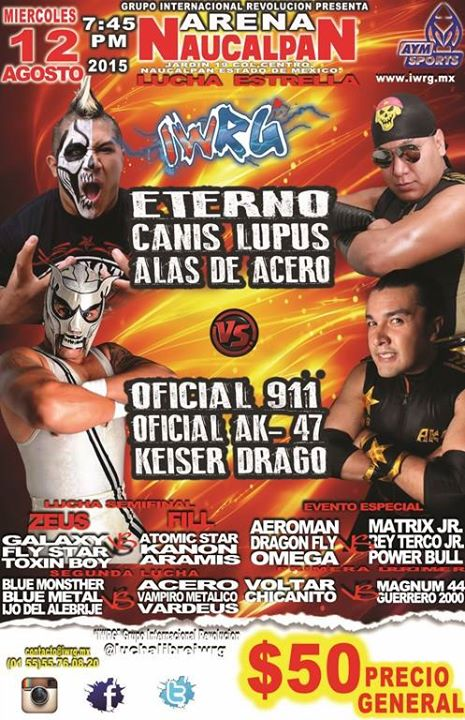 Marduk Jr. replaced Keiser Drago, who was there but in a neck brace after Eterno's martinete last week. Eterno attacked him again this week. Bloody match. Oficial AK-47 used a ref distraction to drop Alas de Oro with a martinete for the win and the revenge. Aramis beat Aeroman. Good match. FILL (Alas de Acero) vs ZEUS (Toxin Boy). Aramis is listed as working twice. Arena de Plata beat Toxin Boy with a legdrop, though team Zeus claimed Toxin Boy kicked out before three. Atomic Star and Pikachu were drawn as captains. 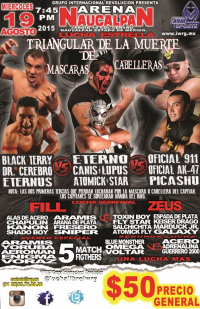 Both teams were brawling outside and almost all got counted out, but Eterno sent Atomic Star in the ring just in time. Pikachu was unmasked as Marco Antonio Guillen Soto, 30 years old, 8 years a wrestler, from Naucalpan. He's the same Pikachu who was wrestling here as that name and Guizmo from 2009-2012. Vardeus' main show debut; he's been on the trainee shows for a year. Looks like it could be a new Ultraman, but nothing's mentioned about a change in the recaps. First appearance by an Ultraman or Kaving since 2012. Bloody match, with the Oficials attacking Eterno. Golden Magic wins the title by taking falls 2/3. Super Nova falls in his second defense. Golden Magic challenged Nova for a title match next week. 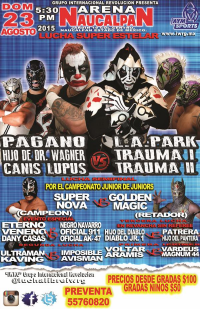 First Park match in IWRG in a year. 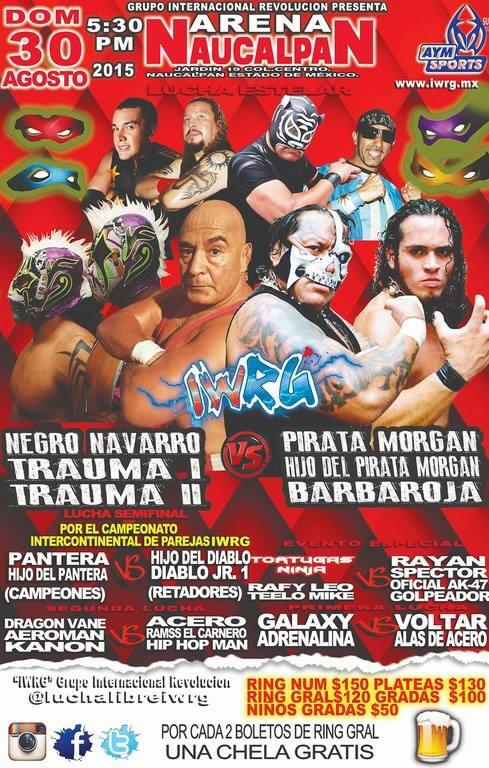 Pagano's debut on an IWRG show, though he's wrestled here for other promotions. 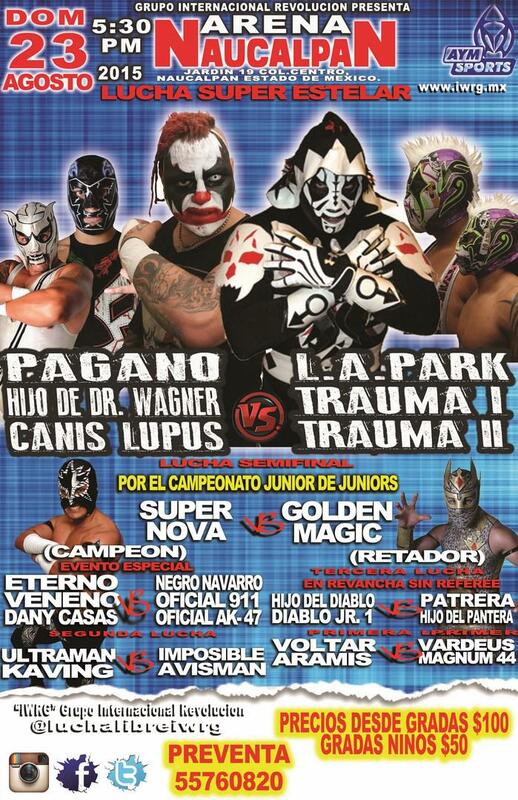 Traumas side is mentioned as being tecnico side, but it might have been rudo vs rudo. LA Park & Pagano feuded, with LA Park disassembling a turnbuckle and hitting Pagano with it repeatedly until the referees gave up and DQed him. All sorts of challenges followed, including a cage match. Fresero Jr replaced Teelo. First appearance for Comando Elite in about 4 months, debut for Arena Aficion's Golpeador.